Hong Kong—Pace Gallery is pleased to present an exhibition of new works by New York-based light artist Leo Villareal. Installed in Pace’s recently-opened gallery in Hong Kong’s new H Queen’s Building, ESCAPE VELOCITY will be the artist’s first solo exhibition in Asia and his second exhibition with Pace since joining the gallery in 2016. Villareal works with pixels and binary code to create rhythmic, non-repeating and random compositions in light. Firmly rooted in abstraction and the psychology of perception, his work is purposefully open-ended and ethereal, encouraging viewers to draw their own interpretations. ESCAPE VELOCITY will be on view July 20 through September 7, 2018 at 12F, H Queen's, with a special opening reception for the artist on Friday, July 20 from 6 – 8 pm. The exhibition features three large Cloud Drawings and an edition of small Cloud Drawings, and three new triptych works, similar to Villareal’s Signature of the Invisible, recently exhibited by Pace at Art Basel. Composed on a square array of LED lights arranged in columns, each Cloud Drawing has its own unique, randomized sequence that evokes natural phenomena through abstract patterns and emergent, unexpected behaviors of monochromatic light. 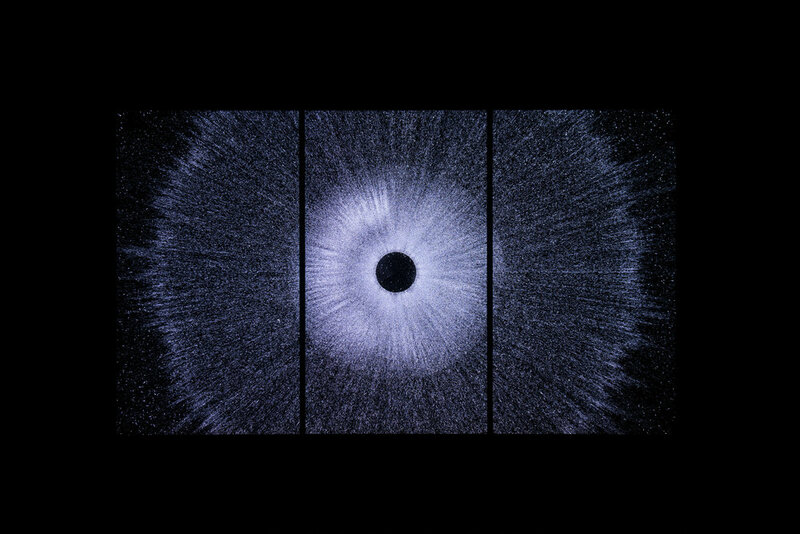 Villareal’s three 4K OLED triptychs, Evanescence, Floating Bodies, and Corona, stretch over 8 feet wide and display high-resolution particle animations created with the artist’s custom software that allows him to further extend the clarity and manipulation of light. A delicate black scrim will hang in the gallery, creating a porous boundary between the two series and enhancing the immersive quality of the installation.